What is the best method of importing/exporting DXF files with QGIS? I work in an engineering field and we use CAD and specialist design programs, and often go through several iterations during a project. I am having trouble interchanging data between QGIS and DXF formats. I export several layers from QGIS in DXF format and load them into cad. Essentially I xref the exported DXF files into CAD, and then draw over the top of them in CAD, as I find it quicker and more accurate. The files line up OK, but need to be scaled and transformed to match the coordinates in QGIS. I then detach the xref's, save the new DXF with line work on a single layer. The DXF file coordinates match the QGIS coordinates. I can't seem to get the new DXF to import back into QGIS. I would like to be able to export and import a particular data table several times as the project develops. Screenshot 1 - I exported the pink polygons and edited them in CAD. I then imported the DXF file back in but nothing came in - see "entities". Screenshot 2 - Attribute table of imported layer. I have been using mmqgis plugin with some success for transfer / export as csv with geometry. The dxf format from the cad system which is suitable for import seems to be 2004-2006, coming into QGIs as a delimited text layer. Obviously I use a UTM coordinate system. For a polygon it will export two files, one is the attribute table. 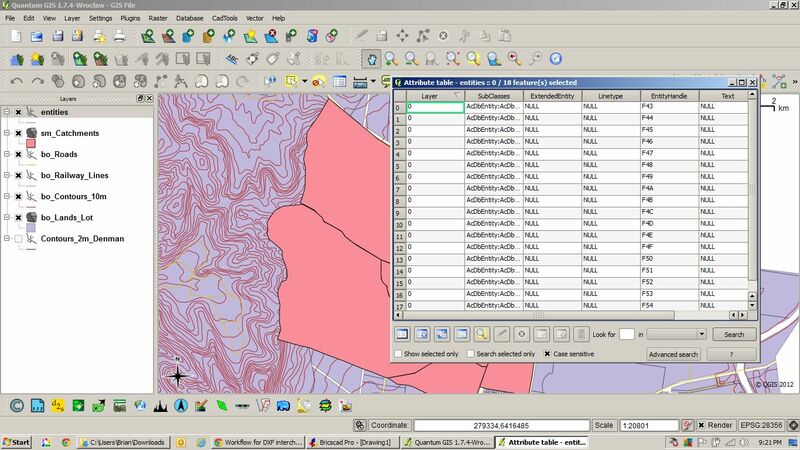 To install mmqgis, you may have to hunt around in the plugin system a little. The main challenge I expect is that cad exports have so many options for the management of blocks, text etc. Unfortunately not that good on the import side. Making sure DXF is in some older standard and do not hope for anything more than import lines, polygons and points without styles, colors, elevations etc. 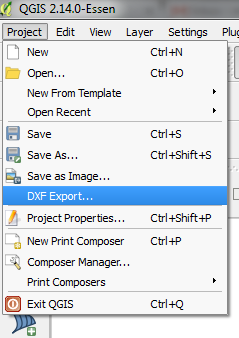 One option if you use autodesk is to use the mapimport/mapexport commands to convert from dxf to shp and from shp to dxf. This will give you the option to keep the data objects if needed. This way you can edit shp in GIS and edit dxf in CAD. You can try intersecting the freshly imported layers with old shape file layers containing attribute informations.